We had a substitute teacher today as our instructor was out of town. 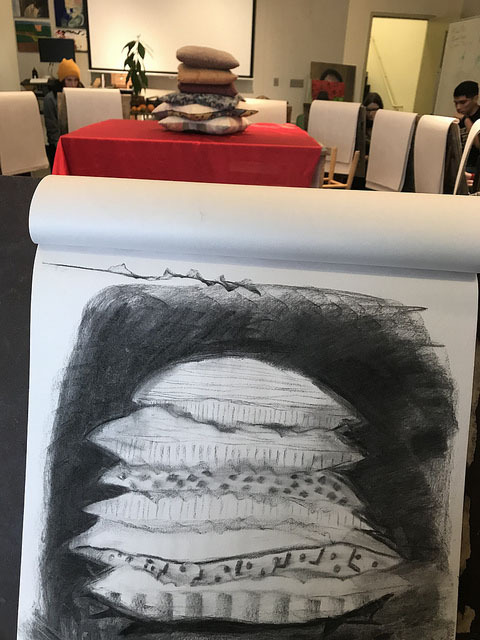 He told us that we would be doing three 45 minute sketches. He must have thought we were advanced students because the subjects he arranged were tough. The exercise was to draw the negative space, not the actual figures themselves. I didn't bother taking a picture of the first study. 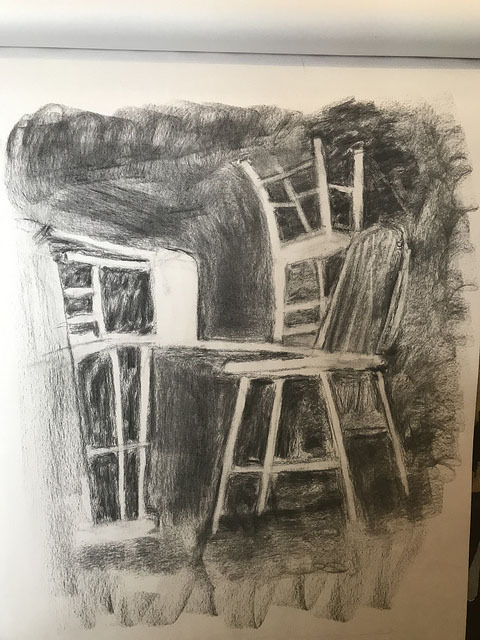 The second one was a grouping of three chairs and a stool. It was hard! The last study was a pile of six pillows and we ran out of time. Some of the students stayed on to finish theirs but I felt like I understood the challenge and hope I don't have to do it again. This is the fourth week of our ten week class. 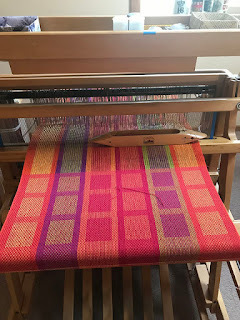 I've been hustling to get this ten-towel warp woven, thinking that any day now I could get called to schedule surgery. All I know is that he does procedures on a Thursday so I know I'm good for this week. When I came home from class today I decided to gamble that I'll have the next two months to weave and ordered ten cones of yarn from Webs. I'm super low on colors, and have only been able to come up with one more warp with the yarn I have. We'll see how it goes, but I'm hoping to hang in there until April 4th.